Did you know that it wasn’t until 1994 that the National Institutes of Health (NIH) mandated the inclusion of women in clinical trials? Prior to that, there were huge missing chunks of research and understanding in women’s health data. Researchers simply left women out of trials due to a concern that their menstrual and hormone cycles would bring unnecessary complications to the experiments. There was a belief that it made no difference if you were treating a man versus a woman; therefore, why complicate a study with uncontrollable variables? Turns out, new research is yielding important new women’s health data. And this health data is proving why healthcare solutions and treatment need to be gender specific. One example: Women’s metabolisms are different. Women metabolize drugs differently than men. This fact alone is just one reason for the critical need for including women in clinical research and trials. What else are we missing in terms of women’s health data and research? A lot actually. But all is not lost. There’s a new technology genre that will change women’s health for the better. It’s called femtech. Women are about 49.5% of the world’s population. Women make 80% of the healthcare decisions in the U.S.
Working-age females spend 29% more per capita on healthcare compared to males in the same age group. Despite those powerful statistics, women’s health accounts for only 4% of the overall funding for research and development for healthcare products and services. Which means that advances in women’s health haven’t come a long way. Why? One reason is that the majority of people making funding decisions are men, who don’t understand the necessity for it. Simply put: Women’s health has a data problem. As in, there is very little. Enter femtech. The term was coined by Ida Tin, the CEO of Clue, a period tracking app and resource for women’s health. Simply put, femtech encompasses any technology geared toward improving women’s lives, whether it be related to period care, pregnancy, childbirth, aging, menopause, fertility, sexual health, or any other number of health-related topics. Femtech is finally giving women’s health the top billing it deserves – and creating lots of new opportunities for the collection and use of women’s health data. This emerging industry is ripe with opportunity because as you can see from the stats we mentioned earlier, women have been left out of a lot of healthcare and clinical research. According to research by Frost & Sullivan, by 2025, femtech is estimated to reach a market size of up to $50 billion. One big benefit of this growing product sector is the access and control it gives to women. Empowering women with knowledge, access, and control of their own health has huge implications. Here are some examples of femtech is doing just that. Nurx is increasing access to birth control with its platform that allows women to order affordable birth control online. Its users don’t need to have insurance or prescriptions to gain access. Natural Cycles is an app and thermometer that allow women to track their cycle and take control of their fertility. Similarly, MyFLO Period Tracker App helps women track their cycle and doles out information and tips based on which phase of the female hormonal cycle the user is in. Willow Pump is an all-in-one, hands-free breast pump that gives women the ability to pump without having to stop what they’re doing and hide in a room. All these products (and more) are giving women more control over their health and their bodies. They are also collecting powerful amounts of data. For example, think of the powerful data that can be collected from women around the world about their menstrual cycles, which can then contribute to research about reproductive hormones and cycles across cultures. Companies like Clue are using the massive amounts of data it collects from users to help with clinician research at top research institutions to advance what we know about women’s health. The prevalence of certain chronic diseases are higher in women than they are in men. The treatment and management of these chronic diseases are also different. Osteoporosis, arthritis, hypertension, depression and anxiety, and Alzheimer’s are just a few examples. There are apps out there now designed to create awareness and coaching specifically for women so they can take preventive measures and manage chronic diseases better. One example of femtech helping with prevention is through period tracking apps. If a woman tracks her period symptoms regularly, she is more likely to be able to tell when something is “off” and make a healthcare appointment. This could help catch some conditions earlier, such as endometriosis or even cervical cancer. It would also give her the tools she needs to accurately report the symptoms she’s experiencing. All this data is leading to greater scientific knowledge about the female body. The more we know about women’s health, and the more we talk about it openly, the more destigmatizing women’s health issues, particularly menstrual and sexual health, become. And the more women’s health data we collect, share and discuss, the more women who can be helped. Femtech is set to be a huge disruptor in the healthcare market with more than $1 billion in funding for femtech initiatives between 2015 and 2018. It’s exciting to see how the collection of data can have such a positive change to an entire group of people. Femtech is not just empowering women with access to information and better products, it’s forcing the clinical research industry to take notice of women’s health. Interested in what else data can do in the healthcare industry? 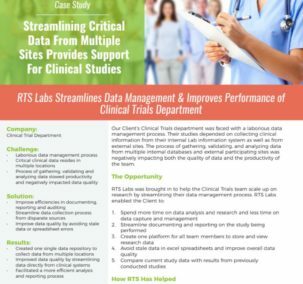 Check out this fascinating true-life story about how we helped a client with clinical trial data – the results are truly astonishing!